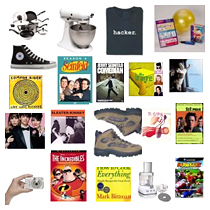 Ok, it’s still a bit early, but as I’ve used Amazon more in the last month than I probably have in all of 2004, I thought I’d point you to my Amazon Wish List which I have painstakenly updated over the last few days, since, you know, I’ve got a birthday coming up in June, and you might want to start shopping early. Keep in mind that if your birthday is anytime after mine, this can really help in attaining a better gift from me. Besides, any gifts you purchase for me may be tax deductable! Posted on Thursday, April 21st, 2005 at 3:00 pm. Subscribe to the comments feed. Both comments and pings are currently closed. Post on your own blog.